Of all the technological breakthroughs made in Los Angeles during the Cold War — the laser, the first supersonic jet fighter, the Apollo moon ship, stealth aircraft, the space shuttle, the intercontinental ballistic missile system and much else — the creation of a communications satellite has had the largest and most enduring cultural, social and economic impact. The little Syncom has morphed into communications satellites the size of school buses, weighing more than 13,000 pounds, operating with solar wings the length of a basketball court and running electronics with more power than a typical house wired to the electrical grid. Electronic credit card authorizations, international television signals, email and social media — all the things that define our modern connected culture — were not even imagined by the public in the 1950s and would not exist today in many areas of the world without communications satellites. 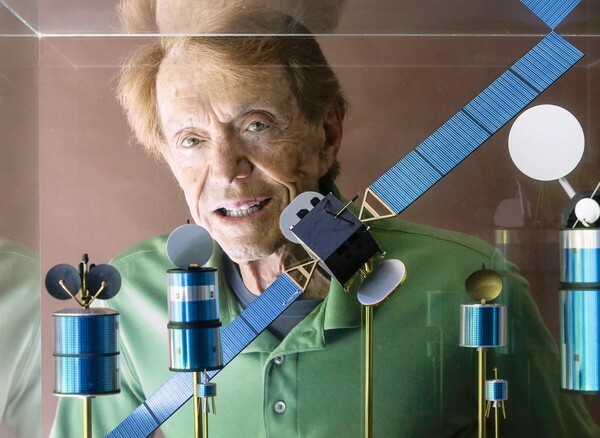 About 500 such satellites are orbiting Earth, allowing cruise ships to communicate with ports, music to be beamed down to radios and television shows to arrive in living rooms, all because of a technology nearly as unknown by the public as Rosen himself. Rosen is an athletic 87-year-old with a full head of sandy-colored hair. He’s lived in the same Pacific Palisades home — with ceiling-to-floor windows that overlook a lush garden — for 60 years. His parents emigrated from Montreal to New Orleans, where he was born. After studying engineering at Tulane University, he dithered over whether to continue his education at Harvard or Caltech. The decision was made when he saw a Life magazine story about beach parties in Southern California. He bought a train ticket. By the time Rosen arrived at Hughes in 1956, the company was gaining prominence in the scientific world. He began designing airborne radar that could spot Russian bombers, but the Air Force canceled the program and his bosses challenged him to find something new.